With the passage of time, they have become valuable visual records of stations and communities that hold interest for railroad and local historians. Change is evident when compared to contemporary scenes, but some elements remain the same. Some depots no longer stand, while others have been restored and are now listed as historic landmarks. Below we take a look at a handful of stations then and now, and you can also get to know the stations from Tour 1 and Tour 2. 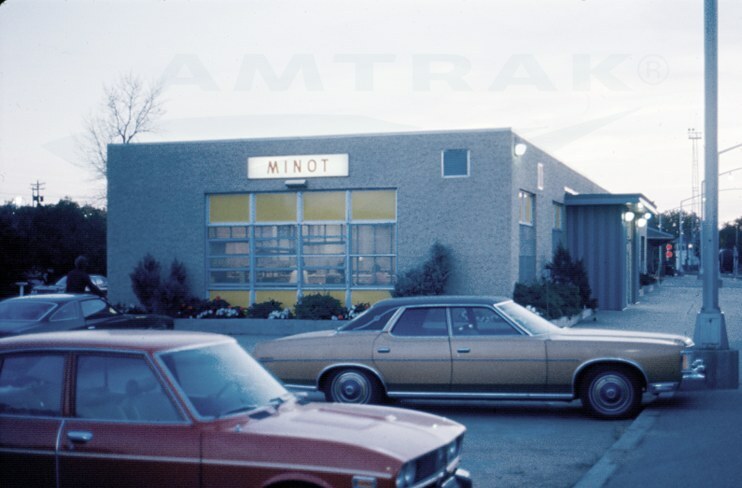 By 1974, modernization efforts had drastically altered the appearance of the Minot depot. The Great Northern Railway built the current depot, located northwest of downtown near the Souris River, in 1905. By 1974, when the photograph above was taken, the building had been given a more modern appearance by swapping out the original gabled roof and installing new windows with large panes of glass and bright yellow panels. Inside, the marble floor was covered with tile. In 2003, the volunteer-led Amtrak Depot Restoration Committee formed to work toward a full rehabilitation of the structure. The effort officially kicked off as part of the first National Train Day celebration on May 10, 2008. Contractors removed stucco from the walls, but because they were not in a good enough condition to withstand the harsh North Dakota weather, a new brick exterior was put in place. The roof was rebuilt and new period-appropriate windows and doors installed. 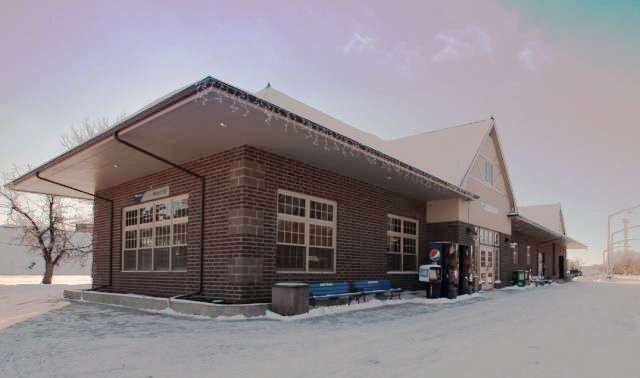 The Minot depot on a bright winter's day; deep eaves protect passengers from snow and rain. Another phase of work included enlarging the waiting room; the spirit of the original design was restored through the installation of wood wainscot, tile flooring, wood benches and a pressed tin ceiling. To celebrate the renovation, a ribbon cutting was held in late 2010. Unfortunately, not a year after the depot project wrapped up, Minot experienced extensive flooding. The depot’s basement flooded and two feet of water inundated the main floor. A subsequent renovation was completed by April 2013, and the city held an open house on National Train Day to show off the facility, seen in the modern image. The old Rockville depot as it appeared in the mid-1970s before its relocation and restoration. The charming Victorian depot in Rockville, Md., was built by the Baltimore & Ohio Railroad in 1873 and was likely designed by well-known architect E. Francis Baldwin. 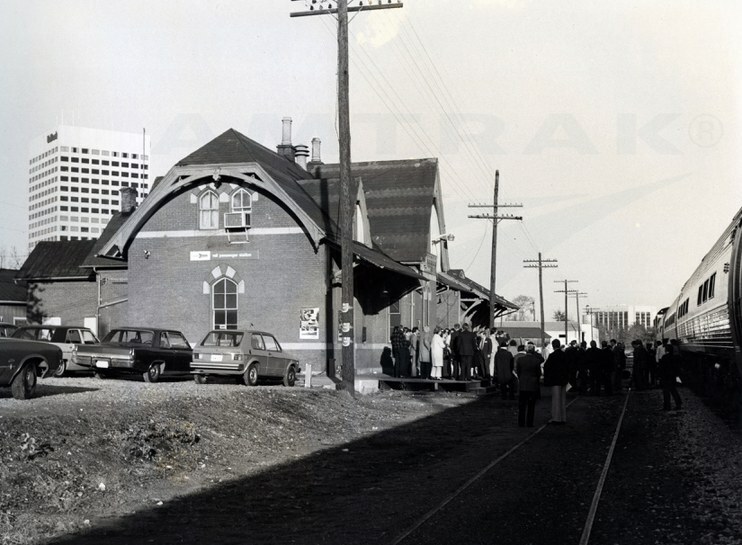 The above image from October 1976 appears to show a crowd gathered for the inaugural run of the Shenandoah (Washington-Cumberland-Cincinnati). An early flyer for the Shenandoah noted, "Now for the first time you can take in eye-opening daytime views of the beautiful Blue Ridge and Allegheny mountains as you travel..." It also touted the use of new stainless steel, single-level Amfleet cars on the Shenandoah—they are clearly visible in the photo. In 1984, Amtrak relocated to a new intermodal center that is today also served by commuter rail, the Washington subway and various bus lines. 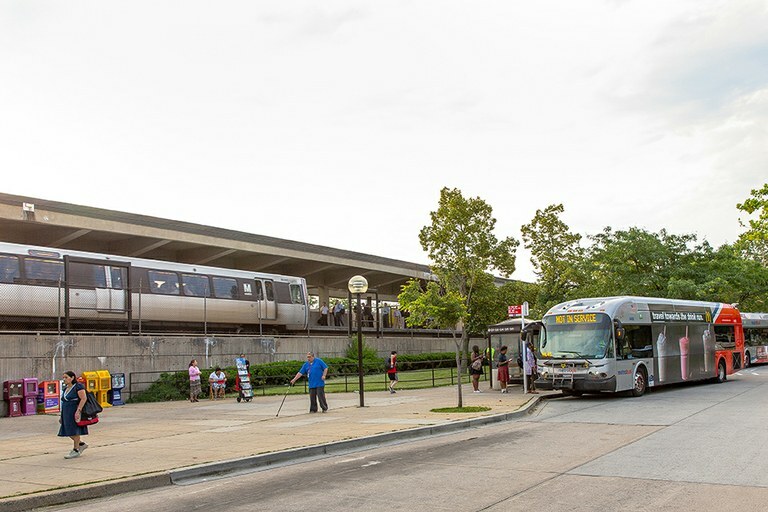 In the early 1980s, the Washington Metropolitan Area Transportation Authority, which operates the region’s subway and buses, pushed out into the Maryland suburbs. It constructed an intermodal transportation center in Rockville to house its services along with Amtrak and Maryland Area Rail Commuter (MARC) trains. To make way for the new complex, the old depot, which weighs 400 tons, was moved south approximately 30 feet. Refurbished as offices, it now stands amid mature trees next to the railroad right-of-way and is easily visible from passing trains. the early 1970s – service had shrunk to just nine trains a day. 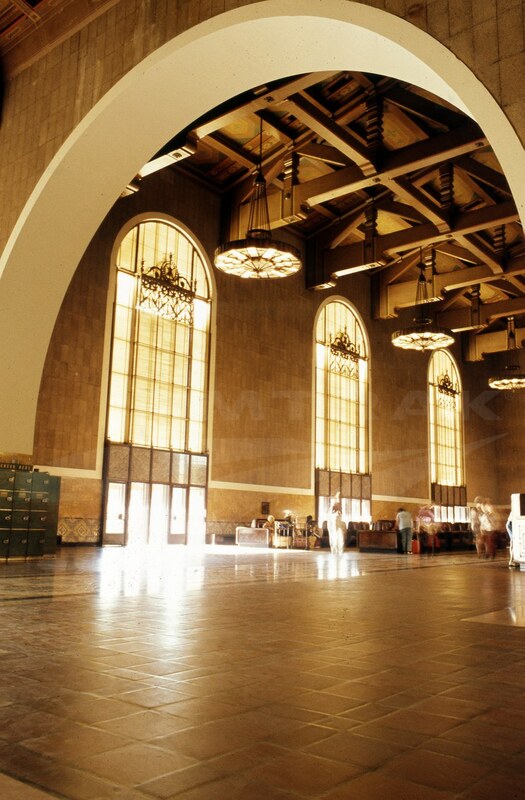 Los Angeles Union Station is a vital intermodal transportation center that serves as a hub for Amtrak intercity passenger rail; Metrolink commuter rail; and Metro rail and Metro bus services. More than 60,000 travelers, commuters and visitors pass through the station every day. Comparing these two images, not much has changed in the main passenger areas—original finishes, lighting and furniture remain in place. Opened in May 1939, the station was intended to consolidate the services of the Southern Pacific, Union Pacific and Atchison, Topeka, and Santa Fe railroads in one modern facility. A multi-day program introduced the public to the new facility. It included a preview and reception for railroad officials, guests of honor and long-time employees; a historical parade with the theme of "Railroads Build the Nation"; and station tours. Regular passenger service began on May 7th. Union Station was designed in part by John and Donald Parkinson. Their combination of Spanish Colonial, Mission Revival and Art Deco designs was used to accentuate the city's personal history and heritage alongside its newly found modernity. In the waiting room, travelers stroll to their trains along terracotta tiled floors accented with inlaid marble strips. Walls are clad with both travertine and early models of acoustical tile. Adjacent to the indoor waiting areas are beautiful enclosed garden patios and courtyards. These lush outdoor spaces were planned by landscape architect Tommy Tomson, who chose a selection of colorful and fragrant plants including orange trees, fan palms and espalier magnolias. Today Union Station is a busy intermodal center served by 28 daily Amtrak trains. It has also appeared as the backdrop for numerous television commercials. 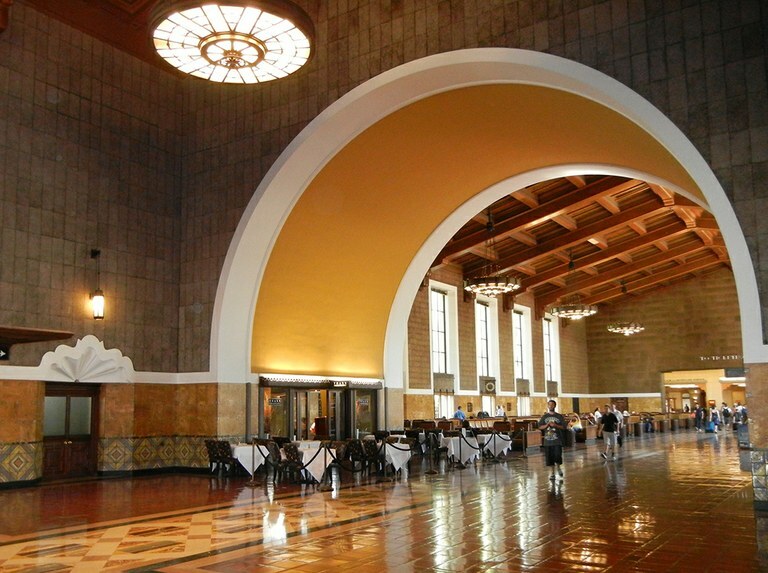 The Los Angeles County Metropolitan Transportation Authority bought Union Station in 2011 and subsequently embarked on the creation of a master plan to guide the station’s future development. The master plan, now being implemented, has four primary goals: celebrate the station’s history and design; improve the passenger experience; create a great destination that attracts not only transit users but also residents and visitors; and prepare for potential high-speed rail service. Do you remember any of these stations from Amtrak’s early days? Share your memories in the comments section below.